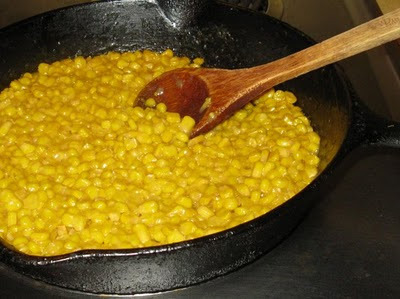 A southern summer favorite, Southern Fried Corn is one of the dishes my grandmother used to make from fresh home-grown corn that we would go pick and shuck ourselves. She would serve it with fried chicken and sliced home-grown tomatoes. It was my favorite summertime meal! This dish is great for anyone who cannot eat corn on the cob such as children with missing front teeth or who are in braces. It is certainly not a low fat dish but, darn, is it good! It's a lot of work so I usually only make it once every summer and put some up in the freezer for later. 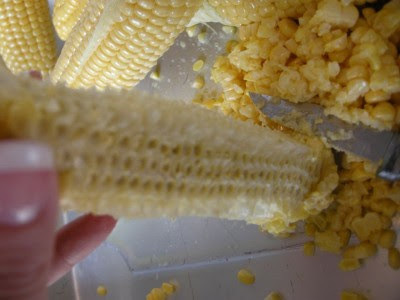 Shuck and clean corn. In a large bowl, holding the cob tip down, take a sharp knife and cut the tops of the kernels off down the length of the cob from base to the tip. 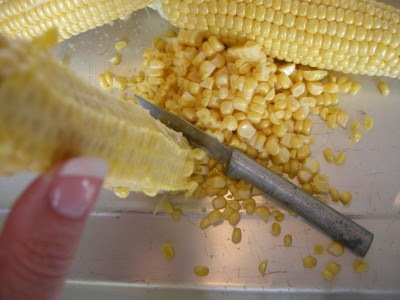 Then using the blade, scrape the knife down the length of the cob to the tip to remove the pulp. When the cobs are clean place them on a rectangular baking pan, add 1/4 inch of water to the pan and soak all turning them to get the cobs wet. Then "wring" them to remove the corn "milk" and set it aside. In a large 16" skillet, heat bacon grease and butter until melted, then add the corn and corn "milk". On a medium high heat, fry until it is mostly cooked and has turned a darker yellow, stirring to prevent scorching. Add evaporated milk and season to taste with salt and pepper. Reduce heat and cook until the mixture thickens, stirring constantly. Check seasonings and serve! I've never even heard of "corn milk"!!!! LOL, it's just when you roll the cobs in water and squeeze it out, it removes the remaining juice from the kernels which is white, hence the "milk" description. You've got to add a little water when cooking anyway and my grandmother decided to do it this way to get every last bit of the corn flavor out of the cobs and it turns out to be just the right amount needed! I grew up in Tuscaloosa, Alabama - was looking for a recipe that was just like my mother & grandmother made -- and this is it! Thanks for posting. I never could figure what I was doing wrong trying to cook fresh fried corn, but I think this recipe must be pretty close to the way I remember as well, sans bacon. Thank you so much for posting this recipe. Hello I was wondering what the measurement size of the can was for your evaporated milk ? Thank you ! !